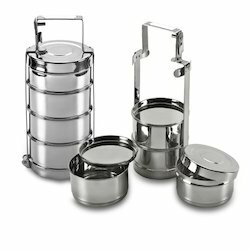 Offering you a complete choice of products which include tiffin box or bombay tiffin, tiffin carriers, tiffin box or thailand tiffin, steel lunch box and pyramid tiffin box. With the aid of our experts we manufacture, supply and export pyramid Tiffin Box or Bombay Tiffin.The shape of this carrier resembles to the shape of a pyramid. The uppermost container is relatively smaller than the other containers. We use quality materials for manufacturing these containers. These carries come with a locking handle. Our customers can purchase these items from us. 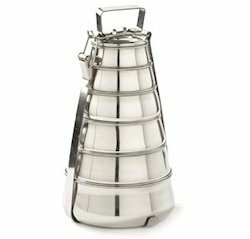 With our expertise in this domain, we are able to offer a superior quality range of Tiffin Carriers. The offered range is known for keeping the food fresh and is admired for its features such as performance and durability. These products are highly appreciated among the clients, owing to their high tensile strength and corrosion resistance. Furthermore, this range is offered in different sizes, grade and forms as per the diverse demands of the customers. 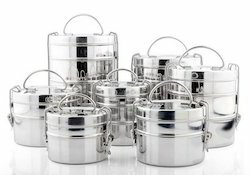 Avail from us wide range of Steel Lunch Box that we manufacture, supply and export. Our experts purchase the raw materials from renowned vendors and use latest tools to manufacture these launch boxes. Our customers can purchase these boxes directly from our company at a lower price. 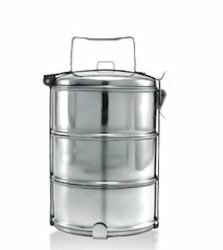 We have lately developed a new design in tiffin/lunch containers. This Pyramid Tiffin Box has a very unique design and has proved to be very handy to our valued customers. We have named it pyramid tiffin due to the design and shape of the tiffin. 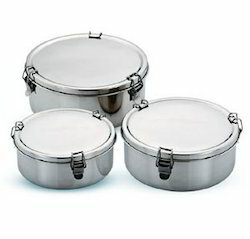 Looking for Stainless Steel Tiffins ?